With avalanche warnings Thursday came proof of the dangers of the fast-melting snow. A snowboarder was injured in an out-of-bounds avalanche on the Warm Springs side of Bald Mountain and some Warm Springs canyon residents had to climb over 10-foot piles of snow to catch rides to work. The shaky snow conditions made the response to the scene on the north side of Bald Mountain just after noon precarious, with the Sun Valley Ski Patrol, Ketchum Fire Department, the Sun Valley Fire Department Backcountry Medical Rescue Team along with the Blaine County Search and Rescue squad all dispatched to help. Even a National Guard helicopter with a harness was on standby 20 minutes away. Out of bounds means outside the Sun Valley ski area, explained Ketchum Fire Chief Mike Elle, who said the two-hour rescue “was pretty interesting,” and that he saw three slides from Guyer Ridge. 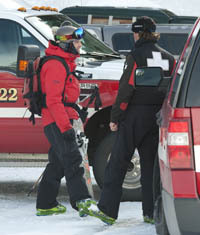 The Sun Valley Ski Patrol was able to retrieve the unidentified man and deliver him to the bottom of the Greyhawk ski run where he was assessed, treated and transported to the emergency room at St. Luke’s hospital at about 2:20 p.m. His condition was not available late Thursday. Before that distress call, sometime in the early morning hours Thursday, an avalanche created a roughly 10-foot-high pile across the road in Board Ranch, west of Ketchum. The area, about five miles beyond the paved road, is prone to slides annually, according to a resident of Board Ranch, stranded on the far side of the slide across Warm Springs Road near Frenchman’s Bend. He said many people climbed over the pile and hitched rides to work, but that he was OK staying put, citing, “Too many animals and plenty of food.” He asked not to be identified so as not to appear a complainer, just a witness. As was the case with the injured snowboarder, responders had much to consider before heading into the woods to make a rescue. Blaine County Road and Bridge Operations Director Char Nelson said that no plowing could take place Thursday due to the danger of additional avalanches. Nelson added that she does not expect to send plows today, Feb. 14, because the Sawtooth Avalanche Center anticipated a snow storm Thursday night that could raise the scale to Level 4, which is high. For any level above 2, the risk of having a human-triggered avalanche is considered likely. The Blaine County Sheriff’s Department said the road was still closed late Thursday from the end of the pavement just west of Lower Board Ranch. The Blaine County website www.co.blaine.id.us has the avalanche scale and snow removal policy available, but will not be updated until Tuesday, Feb. 18. Updates on the avalanche risk can be found at www.sawtoothavalanche.com. The Sawtooth Avalanche Center has issued warnings for several days since the last big snowfall that conditions were ripe for trouble. A skier Wednesday triggered an avalanche while skiing out of bounds, according to their report.